Mood and sunlight, safely soak it up. Mood (a good mood) is critical to optimal living, and those who work in natural light experience improvement. 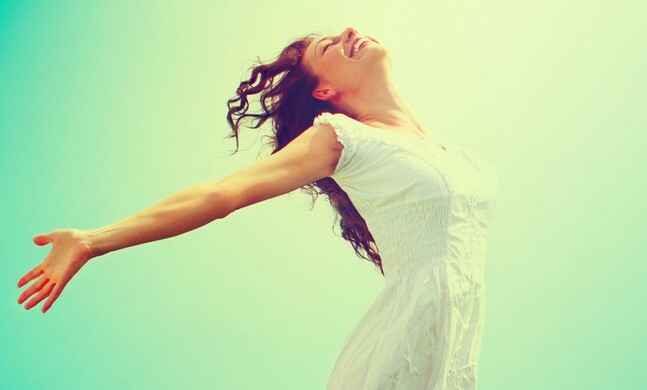 In addition, a good mood leads to better performance, behavior and psychological health. 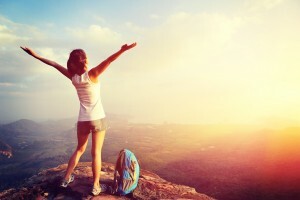 Furthermore, very few things improve wellbeing like arising early in the morning and walking outside on a sunny day: Our attitude improves too, and our serotonin and endorphin levels increase. Consequently, there is an almost immediate feeling of exhilaration. So, we become happier and less confrontational, and our minds seem to click on all cylinders. This mood change is all due to the morning sun exposure. 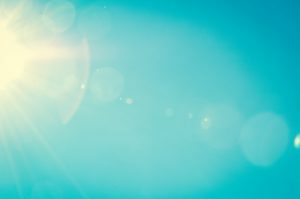 Does midday sun exposure also help? Later on, around midday, we produce large quantities of vitamin D, and our nitric oxide levels increase. That is, of course, if we are fortunate enough to safely sunbathe (with a lot of skin exposed). As a result, we experience a delicious feeling of relaxation and a lowering of blood pressure as the cares of the day melt away. Therefore, mood is again enhanced. Regrettably, due to various factors, most of us live in a society robbed of the sun. We are confined to artificially lighted buildings and poor little cubicles and our mood is crushed. These little cubicles, of course, seem like prison cells that won’t allow our happiness to manifest itself. Consequently, concerned scientists are recognizing that modern humans suffer from artificial, insufficient light in their lives. So these scientists are advocating a return to natural light. One of their studies on the subject of light and mood is most noteworthy. They, due to their concern about light availability measured the impact of windows and daylight on mood. They studied the physiological, psychological and behavioral health of working nurses. First of all, they used biological measurements, behavioral mapping and data analysis in a nursing unit of two wards. While both wards exhibited similar conditions, one ward had more windows and more natural lighting than the other. Change the environment, change the mood. Finally, one can only imagine the potential benefits that could be realized if unencumbered sun rays are allowed. Vitamin D production would increase, and it is likely that patients as well as nurses would improve their health. How does the sun work to improve mood? First of all, what does the sun do to relieve “the blues?” The answer lies in a chemical responsible for transmitting impulses between nerve cells. This “neurotransmitter,” serotonin, is a natural “upper,” working in synchronization with the natural “downer,” melatonin. So, when we awake to sunshine, light enters the eye and stimulates serotonin production. Because of this reaction, sunlight can dramatically increase serotonin levels in the brain and immediately improve mood. Dr. Gavin Lambert and his colleagues in Australia measured serotonin levels in response to varying degrees of bright light. To do so, they drew blood samples from the internal jugular veins of 101 men and compared the serotonin concentrations of the blood to weather conditions and seasons. The remarkable results: Men who were measured on a bright day produced eight times more serotonin. That is, compared to those who were measured on a dismal day. Of course, the mood was improved due to sunlight. 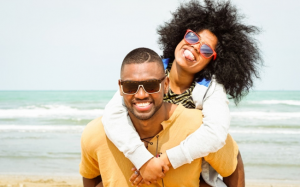 Get your regular, non-burning sun exposure and enhance your good mood! Zadeh RS, Shepley MM, Williams G, Chung SS. The impact of windows and daylight on acute-care nurses’ physiological, psychological, and behavioral health. HERD 2014 Summer;7(4):35-61. Breast Cancer Anyone? Or would you prefer sunlight? Stunning Breast Cancer research shows that the highest vitamin D levels associate with an 80% reduction in risk. Is the breast cancer pandemic due to vitamin D deficiency? First of all, as pointed out by the authors, numerous studies have shown an association between higher vitamin D level and breast cancer. But, other studies had not taken into consideration serum levels of vitamin D above 40 ng/ml. Why? Because that level had been considered the highest level needed for good health. Nevertheless, this study showed differences in breast cancer risk when comparing all serum vitamin D levels, and that made all the difference in the results. The research included 5,038 women . The most noteworthy finding can be summed up in the study conclusions: “Higher 25(OH)D concentrations were associated with a dose-response decrease in breast cancer risk with concentrations ≥60 ng/ml being most protective.” In other words, the higher the vitamin D levels, the greater was the protection. This fact is especially relevant: serum vitamin D levels in 90% of the population are effected by sun exposure. Hence, sun exposure may be the operative factor in the comparisons. Sun exposure causes the body to produce nitric oxide, serotonin, endorphin and brain-derived neurotropic factor (BDNF). Most noteworthy is that all of these photoproducts are vital to human health. Is something besides vitamin D at work in preventing breast cancer? Therefore, it could be that these additional photoproducts added power to the vitamin D produced by the sun. Could the “holistic” sun be more important than vitamin D alone? Of course it is! Another study, little known, may hold the answer. An investigation from Iran, on the association between breast-cancer risk and vitamin D, showed that low vitamin D predicted only a slightly increased risk of the cancer. However, among women who totally covered themselves and thereby had no sun exposure, there was a 10-fold increase in the risk of the disease. In other words, there was a 1,000% increase in breast cancer risk due to sun deficiency. Finally, consider this: With the holistic sun, we get the entire package, not just vitamin D. Embrace the Sun, and don’t burn. Bidgoli SA, Azarshab H. Role of vitamin D deficiency and lack of sun exposure in the incidence of premenopausal breast cancer: a case control study in Sabzevar, Iran. Asian Pac J Cancer Prev. 2014;15(8):3391-6. Marc Sorenson, EdD, for breast cancer prevention. While many doctors know that ultraviolet radiation (UVR) from sunlight reduces risk of breast cancer, they have missed something. UVR stimulates production of vitamin D in human skin. Therefore, many health professionals assume that vitamin D is responsible for the reduced cancer risk. This may lead them to advocate the use of vitamin D supplementation and totally miss the bigger picture. In addition to vitamin D, UVR from sunlight or sunlamps produces many supplementary healthful photoproducts. Among others, nitric oxide, serotonin, endorphin and BDNF are produced by sunlight, and these photoproducts are vital to health. And, it is likely that these healthful photoproducts lead to an inhibition of breast cancer. 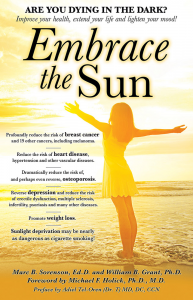 New research shows that sun exposure per se is capable of reducing the risk of breast cancer. An important point about vitamin D, sunlight and breast cancer. Finally, there is no doubt that vitamin D has anticancer benefits. This research however, is especially relevant in that it corroborates what I have said in my soon-to-be-released book, Embrace the Sun. First of all, we must not put all of the benefits of sunlight in the vitamin D box. Secondly, sun exposure performs myriad miracles beyond vitamin D. One of those miracles may be breast cancer prevention and inhibition. Thirdly, if we erroneously believe that we can obtain all of the sun’s benefits from popping a vitamin D pill, we may miss the holistic effects of the sun, which provide a cornucopia of salubrious results. 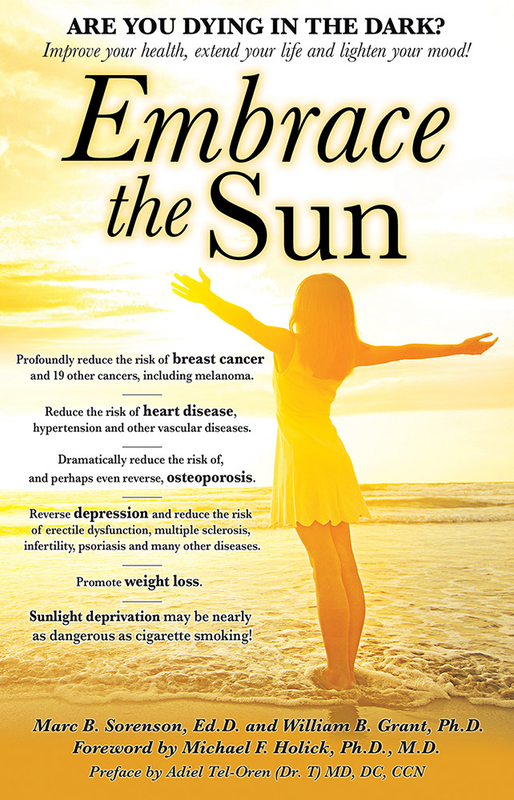 So, safely (without burning) embrace the sun and ease your mind about breast cancer. Anastasia M. Makarova, Flora Frascari, Parastoo Davari, Farzam Gorouhi, Philip Dutt, Lynn Wang, Akash Dhawan, Grace Wang, Jeffrey E. Green, Ervin H. Epstein, Jr. Ultraviolet radiation inhibits mammary carcinogenesis in an ER negative murine model by a mechanism independent of vitamin D3. Downloaded from cancerpreventionresearch.aacrjournals.org on April 12, 2018. 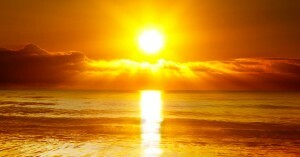 Reduce risk of liver cancer with Sunlight. Sun exposure is inversely associated with risk.. Although liver cancer is generally thought to be related to drinking, other factor such as obesity, HIV infection, smoking, diabetes, socioeconomic factors, drugs and others come into play. A recent study compared sun exposure to liver cancer and adjusted for the aforementioned factors. Sun exposure was shown to be a major factor in reducing the risk of the most prevalent and deadly liver cancer, called hepatocellular carcinoma. The subjects were divided into five groups, or quintiles, based on their sun exposure. In addition such factors as as outdoor activity, geographical residence, urban or rural settings, etc. were adjusted for. Most noteworthy, was the fact that for each quintile of increasing sun exposure, there was a 17% decrease in the liver cancer risk. The only disappointing part to the study was this: The researchers assumed that the positive influence of sun exposure on liver cancer was due to vitamin D production. And, they may have been correct. Yet the sun causes the body to produce many other photoproducts. Due to the sun’s myriad effects, serotonin, endorphin, BDNF, nitric oxide, and dopamine are all increased. Therefore, it is impossible to know if vitamin D alone was the reason for the reduced risk of liver cancer. 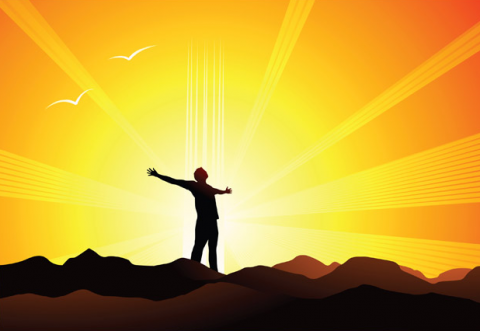 However, vitamin D undoubtedly played a large part in the positive results. And, there is a problem with giving vitamin D the credit without knowing for sure. People may believe, due to this research, that they need only to take a vitamin D supplement to receive all benefits of sunlight. Therefore, they can make very bad assumptions. This is the first study on sun exposure and liver cancer. Probably, this is the first research to show a link between liver cancer and inadequate sun exposure. However, there are indications that sun exposure is associated with a reduced risk of another liver ailment, called fatty liver disease. In conclusion, if you are a liver lover, you can love your liver by protecting it from liver cancer. Hence, you should obtain your share of unscreened, direct, non-burning sun exposure. Happy sunning! and Francine Laden. Ambient ultraviolet radiation exposure and hepatocellular carcinoma incidence in the United States. Environmental Health (2017) 16:89. Gorman S, Black LJ, Feelisch M, Hart PH, Weller R. Can skin exposure to sun prevent liver inflammation? Nutrients 2015 May 5;7(5):3219-39. Bipolar disorder, or bipolar depression, may lead to early death. It is a mental condition characterized by alternating mania and depression, usually interspersed with normal mood. And, it also may include psychosis. Because of the alternating moods, bipolar disorder was previously called manic-depressive illness. The word “manic” means excessive activity, euphoric mood, and impaired judgement. Bipolar disorder affects about 5.7 million adult Americans, and one in 5 people who have the condition commits suicide. Furthermore, the U.S. has the highest bipolar rate in the world. Bipolar disorder is also the sixth leading cause of disability in the world. In addition, it results in a 9.2-year reduction in the expected life span. New (and very exciting) research demonstrates that bright-light therapy has a profound and positive influence on this disease. The researchers conducted a 6-week program to investigate the value of bright light therapy at midday for bipolar depression. The study participants were chosen from depressed adults who were receiving stable dosages of anti-manic medication. The subjects were randomly assigned to treatment in one of two groups: the bright-white light (7,000 lux) group or dim-red light (50 lux) group. At the end of the six-week period, 68% of the bright-light group went into remission of their bipolar problems, compared with 15% of the dim-light group. This is a most noteworthy result. The mechanism by which bright-light therapy performs its anti-depressive miracles is probably through production of serotonin in the brain. When we are surrounded by bright light, the light enters the eye and stimulates the brain to produce serotonin. Serotonin is the master mood enhancer, and anti-depressant drugs work by manipulating serotonin. Hence, these drugs are called selective serotonin uptake inhibitors (SSRI). However, SSRI often have serious, sometimes deadly, side effects. We should therefore obtain our serotonin naturally, through regular sun exposure. Why? Because serotonin can be increased by as much as 800% by spending a day in the sunlight. What a marvelously simple therapy bright light is. And what is the easiest way to obtain it? Go outside during the day, for goodness sake! It is not necessary to go outside at midday. Any time of day, when the sun is shining brightly, should work very well. However, we should never look directly at the sun. That may cause eye damage. Sufficient light enters just by being outside. In conclusion: Safely embrace the sunlight whenever possible, and remove the risk of bipolar disorder. Bipolar Disorder Statistics. BDS Alliance. http://www.dbsalliance.org/site/PageServer?pagename=education_statistics_bipolar_disorder. Sit DK, McGowan J, Wiltrout C, Diler RS, Dills JJ, Luther J, Yang A, Ciolino JD, Seltman H, Wisniewski SR, Terman M, Wisner KL. Adjunctive Bright Light Therapy for Bipolar Depression: A Randomized Double-Blind Placebo-Controlled Trial. Am J Psychiatry. 2017 Oct 3: [Epub ahead of print]. Sun exposure and vitamin D. A common-sense approach to health. The Vitamin D Society of Canada has just released one of the best articles on the relationship of sun exposure and its potential for vitamin D production. Sun exposure is the natural way to obtain your essential vitamin D, and of course provides other essential photoproducts such as nitric oxide, serotonin, endorphin and BDNF. TORONTO, Ont (April 4, 2017) – The daylight hours are getting longer, the sun is getting stronger and summer is just around the corner. Make this the year that you optimize your vitamin D levels through effective sun exposure. Enjoy the health benefits and disease prevention from optimal vitamin D levels and learn to control your risks from sun exposure. Vitamin D is made naturally in your body when UVB rays from the sun convert cholesterol in your skin to pre-vitamin D3. We make about 90% of our vitamin D from UVB sun exposure. UVB rays are short and only reach the earth when the sun is directly above us. We can’t make vitamin D in the winter in Canada because the sun is at too low of an angle and the UVB rays are absorbed in the atmosphere. You make vitamin D in Canada between the months of May and October. The best time for exposure is around midday, between 10am and 2pm, when the UV index is above 3 and your shadow is shorter than your height. The further you get from noon, the lower the amount of vitamin D you’ll make. The sun’s visible light may penetrate through glass, but UVB light will not; therefore you will not make vitamin D.
10,000-25,000 IU of vitamin D in your skin. You can never get too much vitamin D from the sun as your skin self regulates, whereas ingesting vitamin D does not have the same control. In addition, vitamin D that you make from the sun lasts twice as long in your body as vitamin D taken through supplements or food. Statistics Canada reports that Canadian vitamin D levels have dropped by 10% over the past six years. The root cause of this decrease is lower sun exposure. People are just not getting outside around midday in the summer and making vitamin D, and when they are outside they are using sunscreen, which if applied correctly prevents 95%+ of vitamin D production. In Canada, 12 million Canadians (35%) have vitamin D blood levels below the recommendations from Health Canada. This puts these people at a higher risk for several diseases, including cardiovascular disease, cancer, osteoporosis, diabetes, multiple sclerosis, Alzheimer’s disease and many more. In fact, a study completed in 2016 reported that if Canadians increased their vitamin D levels to the recommended level of 100 nmol/L, we would save $12.5B in healthcare costs and 23,000 premature deaths annually. exposure leading to sunburn. People who are a skin type 1, with white or very pale skin colour, red or blonde hair colour and who always burn and never tan, should severely limit their sun exposure. – Know your own skin and skin type. Don’t burn. Never overexpose yourself. – Prevent burning and overexposure when required through the use of hats, clothing, shade and sunscreens. – For vitamin D, get sun exposure at midday, between 10 am and 2 pm, when the UV index is above 3 and your shadow is shorter than your height. – Expose more skin for a shorter period of time to generate more vitamin D while reducing your risk of overexposure. 150 nmol/L (Can) or 40-60 ng/ml (USA). THIS PRESS RELEASE CONTAINS MUCH OF WHAT YOU NEED TO KNOW ABOUT VITAMIN D, SUN EXPOSURE AND HEALTH. Please read it carefully, as it could save your life. Sun exposure is good for sound sleep and health in infants and adults. By Marc Sorenson, EdD: friend of the Sun. Babies who cry at night rather than sleep can wreak havoc on the health, wellbeing and work performance of their parents, so any natural method of helping the baby to sleep well would be welcomed in most families. One of the best natural methods is to expose the baby to outdoor light, and research showed that infants who slept well were exposed to significantly more early-afternoon light than their counterparts who did not sleep well. We have discussed previously in this blog that circadian rhythms are controlled to a great extent by sun or the lack thereof, and these researchers stated, “These data suggest that light in the normal domestic setting influences the development of the circadian system.” Proper circadian rhythms are also vitally important for adults, and when disrupted predict an increase in illness and death from many maladies, particularly from our number-one killer, cardiovascular disease. Melatonin, which should exhibit high levels at night, is a sleep inducer, and its production is enhanced when the lights go out at night. But, for that to happen, there must be sufficient bright light earlier in the day. For babies or adults, here is how the system should work: When we awake to sunshine, light enters the eye and stimulates serotonin production; we then quickly become awake and invigorated, and melatonin is suppressed. At day’s end, however, the bright light disappears (or at least that is how nature intended it), melatonin levels rise, and serotonin levels diminish. We begin to feel sleepy and ideally go to bed for a good night’s rest. It is a perfect system for our needs—that is until we stay up far beyond biologically natural hours by using artificial lighting. Is there and answer to a disrupted circadian rhythm and poor sleep quality? Yes! A paper entitled Circadian clocks optimally adapt to sun for reliable synchronization has the answer. In it, the authors explain that circadian rhythms are best synchronized by sun. It therefore occurs that to escape the ravages of electric lighting, it would be a good idea to reset our biological clocks daily by being out in the morning sun and at other times, when possible, and to avoid long hours of light exposure at night. 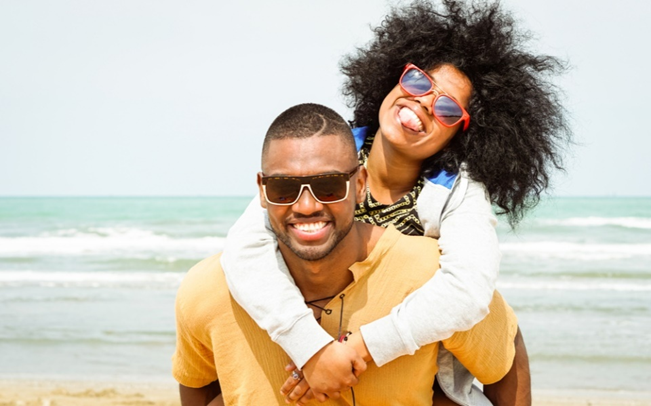 This could be one of the best therapies possible when we feel “out of synch.” And, catching some sun throughout the day would also keep serotonin levels higher and keep our moodiness in check. All of us know that we feel better when we are in the sun. This, coupled with enhancement of health, demonstrates that our friend, the sun, is an essential companion for optimal living. So take care of your babies as nature intends, and also take care of yourself with non-burning daily sun exposure. Harrison Y. The relationship between daytime exposure to light and night-time sleep in 6-12-week-old infants. J Sleep Res. 2004 Dec;13(4):345-52. Jason Brainard, Merit Gobel, Benjamin Scott, Michael Koeppen and Tobias Eckle. Health implications of disrupted circadian rhythms and the potential for daylight as therapy. Anesthesiology. 2015 May ; 122(5): 1170–1175. Hasegawa Y, Arita M. Circadian clocks optimally adapt to sun for reliable synchronization. J R Soc Interface. 2013 Dec 18;11(92):20131018. Disrupted Circadian Rhythms predict Breast Cancer and other diseases. Can we reverse disrupted Rhythms by Camping regularly? Interesting research regarding the critical necessity of sun exposure continues to mount. There is no doubt that lack of sun exposure leads to disease, and a major factor in that scenario is a disrupted circadian rhythm. 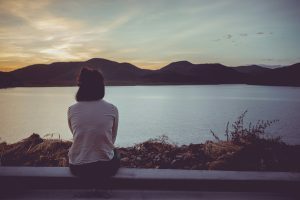 Researchers have stated that “Exposure to sunlight during the day, and darkness at night, optimally entrains biological rhythms to promote homeostasis and human health. Unfortunately, a major consequence of the modern lifestyle is increased exposure to sun-free environments during the day and artificial lighting at night.” Night-shift work is one of the worst contributors to the disruption of our natural biological rhythms, also known as circadian rhythms, and it certainly defines the sun-free environment discussed. There is a strong association of night-shift work to many diseases, but one of the most prevalent of these is breast cancer. Such a cycle would certainly seems natural for humans who were raised on ranches or farms where the day’s activities begins early in the morning sunlight and usually end near sunset. I know, because that pattern described my youth. For primitive peoples, that cycle was probably a necessity to gather the food necessary for survival. It is now ingrained in to our DNA, and disruption leads to disease. So how are circadian rhythms reset to help our health? According to the aforementioned research (footnote 2), it can be accomplished by either a week of natural light exposure, or a weekend spent camping in nature. I am a camper, and I know that when the sun goes down, I am ready to sleep, and when the sun rises the next morning, I’m ready to start my day’s adventures. The message here is that daytime should be spent outside in natural light. This will probably reduce the risk of many diseases, including breast cancer. It is also imperative that our skin receives its sun exposure to produce vitamin D and other healthful photoproducts. In addition being outside in the sun will increase our production of serotonin and enhance our moods. Safely embrace the sun and save your life! Be sure not to burn. Ball L, Palesh, O, Kriegsfeld L. The Pathophysiologic Role of Disrupted Circadian and Neuroendocrine Rhythms in Breast Carcinogenesis. Endocr Rev. 2016 Oct;37(5):450-466. Stothard ER, McHill AW, Depner CM, Birks BR, Moehlman TM, Ritchie HK, Guzzetti JR, et al. A very important paper regarding the necessity for sun exposure has recently been published by the journal Medical Hypothesis. It is entitled Regular sun exposure benefits health, and it discusses the pros and cons of sun exposure. One of the salient statements in the paper is that intermittent sun exposure may increase the risk of skin cancer, whereas regular exposure to sunlight might benefit health. For those of us who have for years studied the beneficial effects of sun exposure, the use of the word “might” is the only drawback to the statement. There is no doubt that for the majority of the population, regular sun exposure absolutely protects and enhances health. I have discussed most of these items on the Sunlight Institute web site, but it was good to see new research that, in particular, separated the health benefits of sun exposure from vitamin D production. The idea that has become popularized during the past decade, that all benefits of sun exposure come from increased vitamin D production, is simply not true and can lead to the supplementation of vitamin D as a “cure” for diseases that may not be influenced by that hormone. Of course, vitamin D is an exceptionally important photoproduct, and the only natural way to attain it is by exposure to the sun or to other sources of UVB light (such as a sunlamp or a tanning bed). The beauty of using these sources, rather than a vitamin-D capsule, is that all of the benefits of nitric oxide, melatonin, serotonin and circadian entrainment are included in the package. Safely enjoy the sun, and you then will also safely enjoy better health. Remember not to burn, and to gradually develop a good tan.